Knott's has grown and changed a lot over the years, roller-coasters have replaced mule rides for the most part, but deep in the heart of Knott's some things remain timeless. 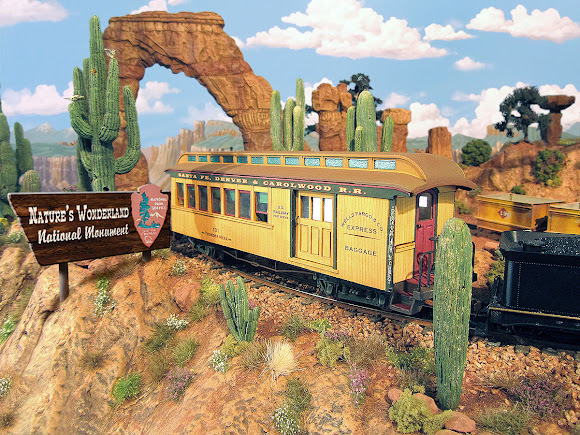 Calico Mountain still rises high above Ghost Town with its red rock spires, thundering waterfalls and, of course, its one of a kind mine train ride. 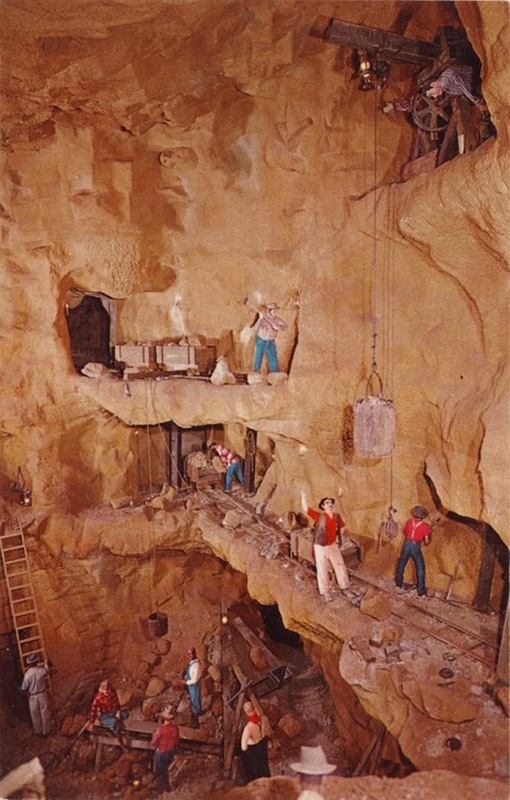 The Calico Mine Ride opened in 1960, the very same year that Walt Disney's re-imagined Mine Train Thru Nature's Wonderland reopened to the public following a major expansion. 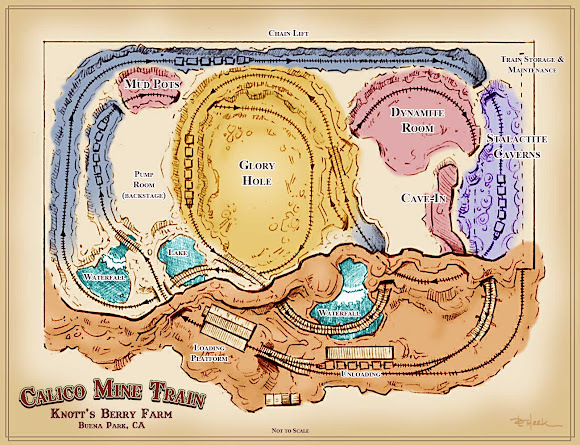 And though the two attractions are both fanciful and share a similar theme, the Calico Mine Train has always been more true to real-world mining lore of the Old West. The Calico Mine locomotives are steam outline engines, that is, battery powered mine engines dressed up to look like 19th century steamers. Each one has a different paint scheme and individual details. The man in the string tie is Bud Hurlbut, the ingenious fellow tapped by Walter Knott to build the Mine Train attraction. 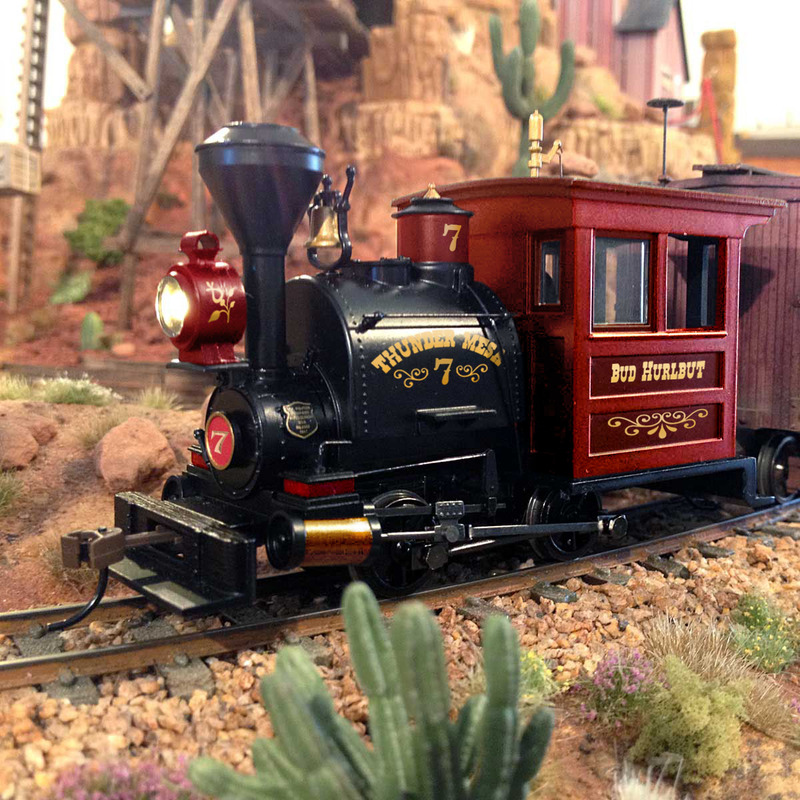 Wendell, "Bud" Hurlbut got his start designing and building small-scale train rides for amusement parks. Of the many he created, perhaps the most well known were at the Pike in Long Beach and at Santa's Village in Lake Arrowhead. In fact, the amusement business he founded still exists today as part of Katiland Trains Amusement Co. in Temecula, CA. 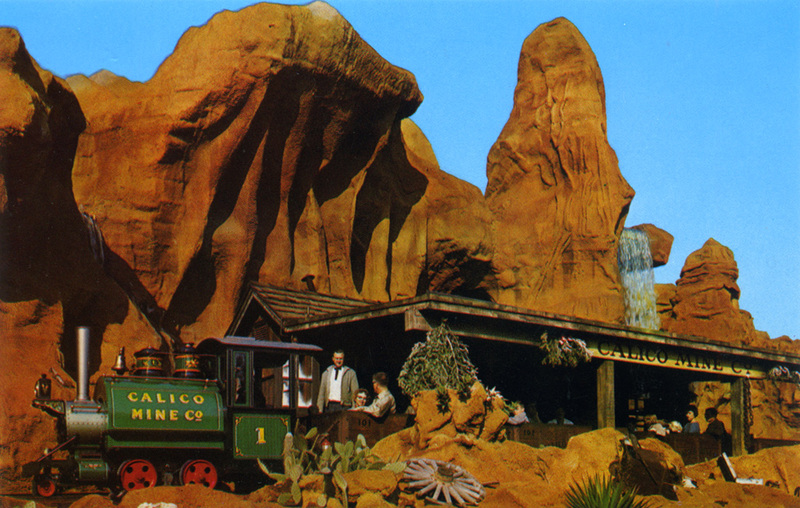 Of all the train rides that Bud built, his crowning achievement has to be Knott's Calico Mine Train. Part train ride, part dark ride, built inside its own seven story concrete mountain, the mine train was innovative to say the least. And it has been admired and emulated by theme park designers, including Disney's, ever since. Some say it was the world's first immersive themed dark ride, something that would pave the way for Disney's spectacular success with attractions like Pirates of the Caribbean and The Haunted Mansion. It had the first hidden themed queue and used theatrical lighting and sound effects to bring its many unique scenes to life. Hurlbut's contributions to Knott's cannot be overstated. More than anyone else, he was the man responsible for transforming the property from a roadside berry stand, Ghost Town and chicken restaurant into a true theme park. 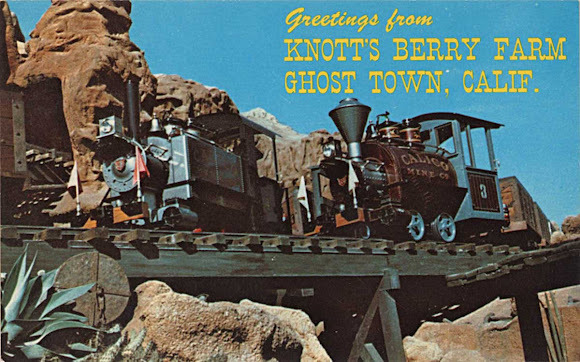 Vintage postcard from Knott's featuring the Calico Mine Ride. 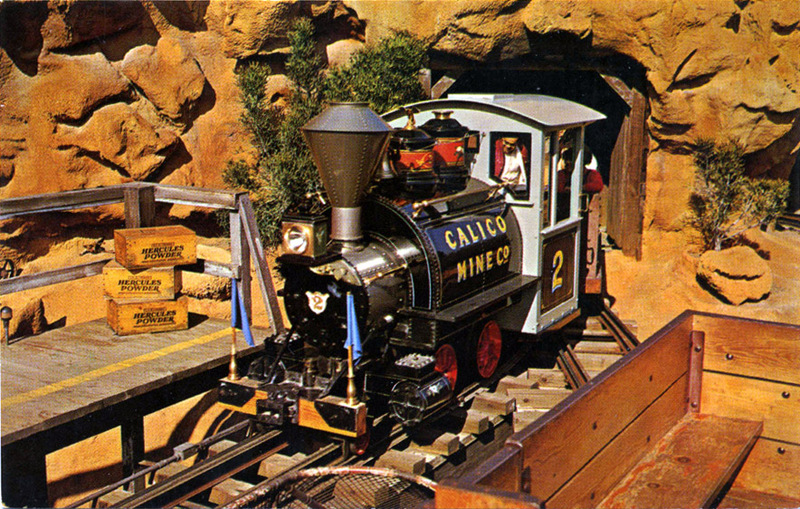 Ride the Calico Mine Train! 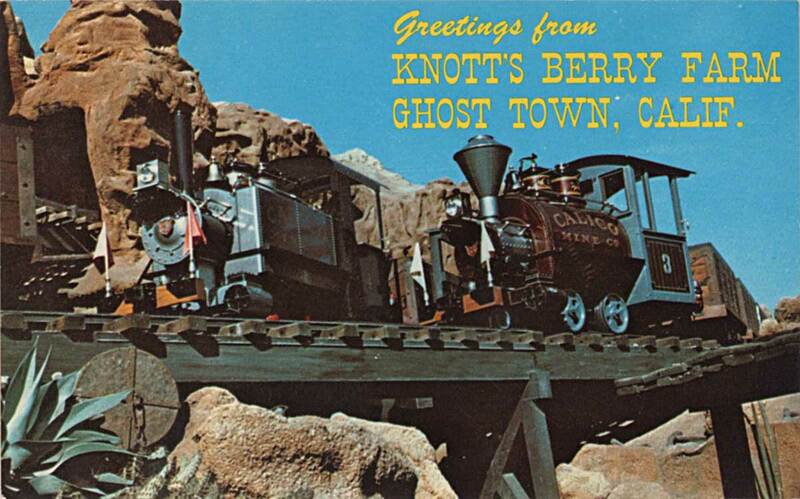 I grew up in Orange County, just down the road from Knott's and got to ride the Calico Mine Train many times as a kid. It must have made an indelible impression since now, decades later, I'm trying to incorporate some of its flavor into Thunder Mesa. As a kid I could never quite figure out the track layout of the ride (there were way to many twists and turns in the dark), but now I've got a better handle on it and was able to come up with the graphic below. This isn't exact, and nowhere near to scale, but it does give an idea of the scenes, the track layout and how it winds in and out of the show building. There are six locomotives all together, all run on rechargeable industrial batteries, and as many as five trains can be on the line at a time. Each train has five cars that can hold ten guests each. The entire ride is about 8 minutes long and train speed is controlled by the operator. Each train operator must take care with timing so that audio effects stay in sync with the ride. Top speed is about 5 miles per hour. Beyond the sheer scale and scope of the ride, Bud Hurlbut's real genius was in using a chain lift to bring trains from the lowest level to the highest level of the show building. Chain lifts have been used on roller coasters for many years but I think this may be the first instance of using one on a dark ride. 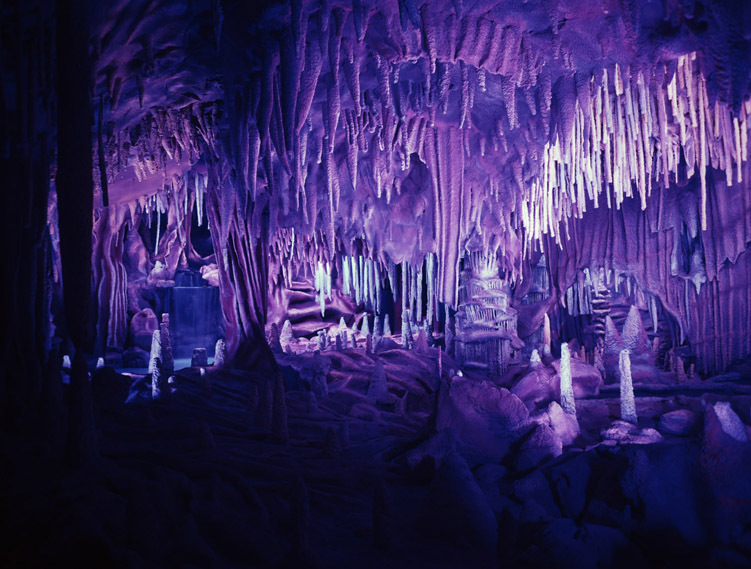 At the top of the lift hill is what's always been a major highlight, the Stalactite Caverns or "Heaven Room" with its colorful black-lit formations and etherial music. At the heart of the ride is the massive Glory Hole gold mining scene. The train passes through this scene three times on three different levels. It's hard to estimate how much of my Thunder Mesa layout has been inspired by Bud Hurlbut's wonderful Calico Mine Train. 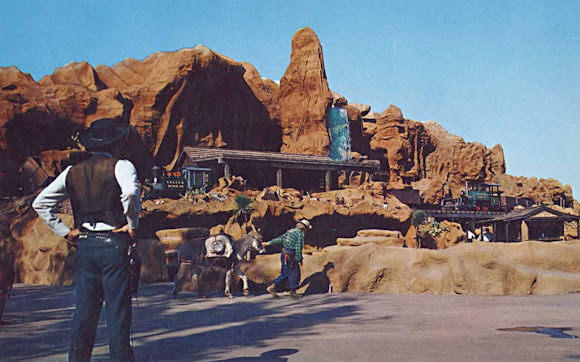 I now that his work has inspired many at Disney, including Walt himself, who would come over to watch the construction as massive Calico Mountain took shape. Let's just say I don't know if we'd have a Big Thunder Mountain if it weren't for Bud's mine train. Thunder Mesa owes a lot to the Calico Mine Train, both directly, and as a source of inspiration for others who have, in turn, inspired me. I've always wanted to include a tribute to Bud Hurlbut and the Calico Mine Train on the layout. That distinctive rock pillar, waterfall and the face of Calico Mountain will be added to the TMMC at some point in the future. I also want a Calico type engine. Since they are all different, I decided to freelance something that hopefully captures some of the flavor. This is a Photoshop rendering of the proposed paint scheme for what will become Thunder Mesa #7, the Bud Hurlbut. I have the locomotive, the paint, and the custom decals are ordered. Now it's just a matter of putting it all together. As an extra bonus today, here's a video of engine #7 (before paint and decals) taking a grand circle tour of the layout. Thanks for checking in everyone. Adios for now! Happy Easter from Thunder Mesa!